A Technocratic Elite or Luciferian Elite are using manufactured crisis or chaos to bring in a New World Order from the ashes of the old order. On every level from the terrorist attacks in Paris, the rise of ISIS, nations like Russia, NATO, Syria, Iran, Iraq, EU, United States, China and Israel are being drawn into the vortex of World War III. Yet, in the middle of this chaos, we can see the power of God released on our nation and our lives! The predicted one world government, one world economic system and one world religion is falling into place under the secret agenda’s of the United Nations through stealth program like Agenda 21, the Paris Climate Change Treaty, Sustainable Development. Yet, very few know about the Luciferian Agenda of the UN which began with the teachings of Alice Bailey who established Lucifer Trust on the grounds of the UN after being instructed by a Tibetan spirit guide. There are powerful Satanic forces being used by the Illuminati, Skull and Bones, Bohemian Grove and other groups which are seeking to destroy America as we know it by strategically attacking the traditional family, Christianity, Christian values, patriotism and the Constitution through social engineering, the Trojan Horse of immigration of Militant Muslims from nations like Syria to launch one ISIS leaders say will be a major terrorist attack greater than 911. False prophets and false teachers abound in the church undermining it from within. In addition very real supernatural powers and occult forces are being used with occult technology by a Luciferian Elite. However, just as in Nazi, Germany, the so-called Christian Church has been lulled to sleep non-Biblical teachings which replace the supernatural power and authority of the Word of God with man-made and humanistic teachings. The American church and its leaders, is following in the same footsteps as the Christian church in Germany, when Adolph Hitler was elected by Christians to rule Germany. Hitler was deeply in involved in the occult and the Third Reich was an occult party first and a political party second. While the Evangelical Christians of Germany were rejecting the supernatural power of God, the leaders of the Third Reich openly participated in Satanic rituals to access supernatural power. The Nazi rocket scientists, Nazi mind control scientists and Nazi genetic scientists were accessing occult technology from another dimension which allowed them to lead in the rocket programs, scientific mind control like MK ULTRA and an attempt to use the science of eugenics to breed a transhumanist master race. Adolph Hitler like the Communist leader Lenin, used the fear of terrorism to create a totalitarian and Orwellian State. The tragedy is that if the Christian church in Nazi, Germany believed in and taught about the supernatural power of God, they could have stopped all this from happening! Now in America, the same deadly dynamics are at work! 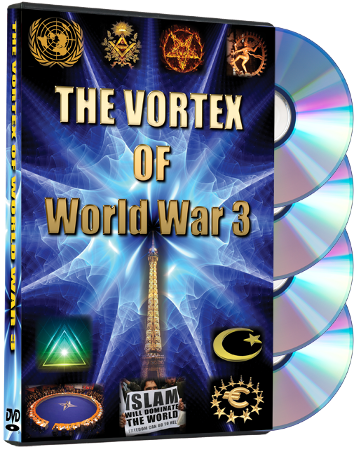 In this powerful 4-DVD set entitled THE VORTEX OF WORLD WAR 3 by Paul McGuire, Paul teaches on the importance of God’s people repenting, praying, interceding and in engaging in spiritual warfare. After a vision from the Lord on July 4, 2012, where the Lord showed Paul that it was His desire that America experience a Biblical Revival and a Third Great Awakening, Paul McGuire has been teaching on this message and leading millions of God’s people around the world in repentance and prayer that can unlock a mighty Third Great Awakening in America and in any nation where God’s people will come to Him. At a recent meeting in Phoenix, AZ, Paul began to teach on “The Battle for the Portal.” Paul gave a powerful prophetic message in Phoenix, which is a city named after the occult bird the Phoenix which is a symbol of the Illuminati principle of “Order Out of Chaos.” The Phoenix is burned alive, dies and then rises from the ashes in a new form. This is an occult teaching that America and the world must be destroyed in its present form and then rise from the ashes. The city of Phoenix, is a symbol of the new world order and it is located on the 33 degree parallel. The occult symbolism behind the number “33” is the highest level in Freemasonry. An occult portal was opened in Phoenix through many rituals such as the 2015 Super Bowl where Katy Perry conducted a Satanic ritual with countless millions watching. In this 4-DVD set, Paul will explain how the Bible teaches that both demonic and Heavenly portals can be opened or closed through both Satanic or Biblical worship. The Tower of Babel was a demonic interdimensional portal or Stargate which is translated “gate of the gods” and allowed fallen angels into the earth. In contrast, the Old Testament account of Jacob’s Ladder, reveals how God opened a Heavenly portal where a supernatural ladder allowed for God’s angels to come into the earth and go back into heaven. • Personal revival and a Biblical revival in families, churches, communities and our nation. • The cities of America can burn with the fires of revival and not the fires of race riots. • God can supernaturally intervene in our nation’s economy, political and social systems. We are not to look to our political leaders, both to men or women from either the left or the right to save us. We are to pray for our leaders and participated peacefully in the political process. Like the First and Second Great Awakenings, America can experience a mighty revival that can drive back to significant degrees the powers of darkness. Paul does not teach that we can over rule God’s Sovereign Prophetic Word or change God’s end times program. But, where God has not specifically spoken in His Word, we are to obey the Lord and engage in peaceful spiritual warfare for our nation. Economic crisis and even economic collapse looms on the horizon, God is prepared to supernaturally intervene, if God’s people will seek His face. America and other nations in the world which have rejected and disobeyed God’s Word have opened portals where the powers of darkness are controlling large sectors of the society like politics, culture, education, the church, family, government and other institutions. The Bible teaches that when the spiritual enemy comes in, like a flood the Spirit of the Lord will raise up a standard against him. If God’s people will repent of “playing church” and seek God with a holy passion, “For the Kingdom of Heaven Suffers Violence and the Violent Take It By Force,” God can pour out the supernatural joy, hope, love , healing, faith, provision and transform our land to whatever degree He chooses. We can have a hope for the future and our children can have a hope for the future. Order this 4-DVD set now and learn how to be used by God to bring in a mighty revival!